Frameless shower doors are sleek, elegant, and ultra-modern. Often custom-made, these shower doors come in nearly limitless configurations of shape and size, and can have unique features including hinges and handles. What’s more, because they are made of smooth glass, these doors are incredibly easy to clean, allowing them to maintain a clear and pleasing appearance with very little effort on your part. There are a number of aesthetic advantages offered by frameless shower doors, but certain practical considerations may reduce their appeal to some families. These doors tend to be more expensive both to purchase and install, and may be more prone to leak following installation. To allow frameless shower doors to open and close, a small space is necessary between the bottom of these doors and the floor of the shower. Because there is no frame to prevent water from splashing out of these small spaces, frameless options can allow for water to spill onto the bathroom floor – a safety concern for families with smaller children. In the end, the choice to install a frameless shower door should be based on your aesthetic desires and family’s specific needs. 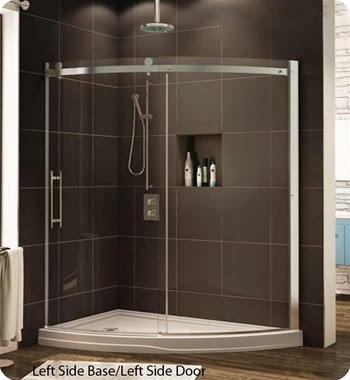 If a frameless door is not ideal for your family, there are a number of framed options available that can improve the appearance, cleanliness, and appeal of nearly any shower enclosure.